wheelbase and listed for $975 f.o.b. Windsor, Ontario. 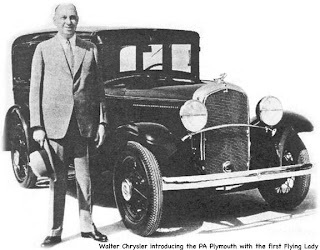 Walter P. Chrysler finally got a car with his own name on the radiator in 1924. Chrysler was an instant success, selling 429 units throughout the Dominion while the smaller Maxwell companion car sold 773 units. For 1925, the Maxwell was re-christened as the Chrysler 58 and a very posh, majestic Imperial series was added to the Chrysler line. Sales were very good for Chrysler Canada: the 1926 tally shows 5,815 units built in Windsor, Ontario including 88 units in the massive Chrysler Imperial 80 series. In 1928 Walter performed a hat trick. He bought Dodge Brothers. Then he added the mid-range, mid-priced DeSoto. Because he also wanted to have a presence in the low-priced field, he introduced the Plymouth. Walter was so proud of the first one he drove it off the line himself, motored over to Henry Ford’s house and gave it to him. The 1932 Plymouth Convertible Coupe with Rumble Seat could be had for $880, f.o.b. Windsor. As was the custom, the carmakers introduced their new models around Christmastime. The 1932 Plymouth lineup was a holdover from last year and consisted of Standard and DeLuxe Sedans, a Business Coupe, a Convertible Coupe, a DeLuxe Coupe and a Roadster. They ranged in price from $655 for the latter to $825 for the enclosed sedan with the Safety Steel body. In April of 1932 ten new models bowed for the public—including the biggest Plymouth to date—an elegant seven-passenger enclosed Sedan riding on a $121-inch wheelbase. was the two-door Roadster listing for $695 f.o.b. Windsor. The look was rakish and low. Engineers made good use of the Rigid-X Double-Drop frame to lower the envelope’s overall height. While 18-inch wheels were standard, even smaller 17-inch wheels could be had in wood or wire at extra cost. The car boasted a one-piece fender. Prospective owners were invited to grab hold of the massive fender and pull to note how rigid and strong the heavy gauge steel member actually was. To emphasize this, folks were shown that the fenders were fastened into place with two braces instead of one. Interiors were most thoughtful including tailored upholstery, a braided robe support cord and assist cords made of genuine silk. Armrests gave a “touch of luxury and comfort” to sedans. Chromium and walnut smoking sets were part of the base price as was tapestry carpeting with deep underpadding and “charming” metalware for the doors and windows. Instrument panels were set in a turned aluminum facing and included a full compliment of dials and gauges—all indirectly lit. 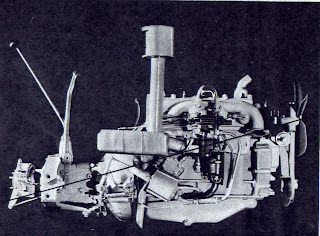 four-cylinder Silver Dome engine with Floating Power, rated at 65 horsepower. The little four-cylinder Silver Dome L-head Plymouth motor cranked out 65 earnest horsepower. It promised to deliver the “smoothness of an eight—economy of a four!” Despite its modest price, Plymouth was loaded in value and frankly dripped with standard equipment that was optional on other low-priced cars. Plymouth included Free Wheeling, Easy-Shift three-speed manual transmission—complete with Silent Second gear—shock absorbers, hydraulic brakes weatherproof (!) brakes with centrifuse brake drums, moulded non-burning brake facings. The engine came with a carburetor air cleaner, a fuel filter a fuel pump, an oil filter, a heat indicator on the instrument panel, bandit-proof door locks, steel running boards with moulded running board covers, a built-in radio antenna and a full set of tools. Extra cost items included Duplate Safety Glass, 17-inch wheels with 5.50-inch tires, a radio and an Automatic Clutch. The most expensive Plymouth in the 1932 ChryCo stable was the Convertible Sedan. It carried a hefty $1,070 price tag. To keep dealers afloat all Chrysler dealers across Canada automatically became Plymouth vendors in 1932. Certain dealers were authorized to carry Dodge and DeSoto models in addition. Despite the market revamp the sales story was a grim one. From Sydney to Victoria, only 156 of the warmed-over PA models sold in 1932. The last one came off the line in June. Fortunately company records show manufacture of the larger PB series began in the Lynch Road plant in February. Workers in Windsor, Ontario built a total of 2,702 PB units that year by workers. Records further show that two PB models were imported from the USA and 91 were exported outside of the Dominion of Canada. Copyright James C. Mays 2007 All rights reserved.